The story of the Hero Porker attracted my interest earlier this week. This was an account of a large pig that was buried in the recent Sichuan earthquake but somehow managed to emerge alive after thirty six days trapped beneath the rubble. So it was with just a twinge of guilt that I got stuck into a large roast pig knuckle with lashing of mash potato while lunching at The White Dog Cafe in Vivo City. We enjoy this eatery for its $10.80 set lunch and for its eclectic mix of western and eastern cuisine. Best of all is the view out to Sentosa Island and watching the Temple of Mammon (i.e. the Sentosa Integrated Resort/casino) take shape. There is more than a touch of motor mania in Singapore at the moment as the city builds towards the hosting of Formula One's first night race later in the year. 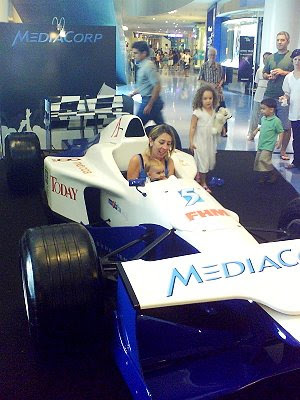 On display in Vivo City was a racing car sponsored by MediaCorp and it had the rapt attention of youngsters lining up to try out the drivers seat. Some (as in the photograph) were perhaps a little young to fully appreciate what was happening. Anyone who has been involved with motorsport will tell you it is the sound of high speed cars and the smell of the high octane fuel that makes the sport so addictive. At an early stage of my life even I joined a central North Island car club in New Zealand and was the proud owner of a modified purple Mini Cooper. But those days are long past and the thought of watching an seemingly endless procession of cars career around a track at night hold little interest for me. The roar of engines however stays with me. One good reason that it does so is that for the past two Saturday evenings, just on dusk, the aerobatic team from the Singapore Air Forces go through their paces as they practice for the forthcoming National Day Parade, early in August. These jet aircraft in synchronisation are truly a magnificent team and the rate of climb into the evening sky is wondrous to behold. All of this is viewable from the sanctity of our condominium lounge. There is a push to integrate so-called 'citizen journalism' in to the local Singaporean media. This means in practice that daily rags such as My Paper have a section called Ground Zero where miscreants are exposed. Today's riveting entry was the discovery of a broken cigarette lighter in a bowl of fish head curry. No doubt a different interpretation of the culinary flambé process. When the patrons said something like "waiter there's a lighter in my soup" the response they received from the proprietor was terse. He is reported as saying that he would cover any medical bills should his patrons require treatment after consuming his curry. Very generous I must say. Given the cost of medical treatment here it could turn out to be the most expensive dish of fish head curry ever. Continuing on the subject of seafood, Ground Zero's next story covers some enteprising Singaporean merchant who is apparently using his local car park to sun dry ikan bilis. Ikan bilis for those of you who are not familiar with the name are the small anchovies that are much beloved in Malaysian cuisine. They have a pungent odour when drying but not as pervasive as the small dried shrimps that are used for Malaysian sambal. According to the experts when buying a catty of ikan bilas one should look them in the eye. The best quality ikan bilis will have bright blue colored eyes according to the pundits. Given their size when processed I don't think I will bother. They all taste good to me and are the perfect condiment to a good nasi lemak. In excited tones the reporter on last night's Channel News Asia informed us that traffic had been mysteriously stopped in the area of Marina Boulevard. A clearly nervous and reticent foreman in a hard hat did his best to avoid answering any questions, even at one point attempting to hide his identity by pulling the brim of his hard hat over his face. After several seconds of muffled response the hat in question was pushed back to its original position but the answers were no more forthcoming. Was an event of great national significance unfolding before our eyes? Perchance a threat to national security? The answer was far more mundane. There had been a subsidence in the road and it appears to be related to the construction of an underground tunnel at an adjacent construction site. As a result, Marina Boulevard was closed for six hours while inspectors evaluated the situation and determined there was no lasting danger. I mention all of this because such incidences appear to be an increasing occurrence in Singapore. The underworld of the Republic is becoming a rabbit warren of underground pedestrian walkways, MRT lines and utility tunnels. Add to this the vibration of the manyfold construction sites and the fact that much of Singapore does not sit on bedrock and it is therefore not surprising that such events occur. The resulting blockage to road traffic occurred on the same day as government agencies announced a further hike in ERP charges. These increases are an attempt to dissuade the use of motor vehicles in the central city areas at peak periods. The charges are levied electronically as a car passes under an ERP gantry and every vehicle carries a digital box and cash card from which the sum is subtracted. This miracle of technology appears to to be having some effect in curbing motor vehicle use and enhancing the value of public transport. As the ERP rates climb, Singaporean motorists are also experiencing that sinking feeling. 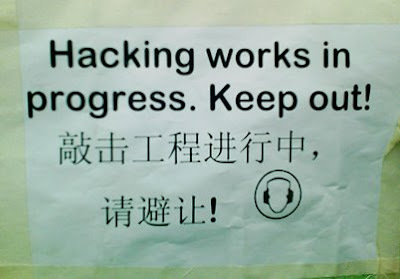 Yes we have hackers in Singapore! It was the hairy-backed monk that I remember most. Crouching low in his saffron robes as he rummaged around the convenience store's lower shelves looking vainly for a small bottle of shampoo. His Esau-rian attributes seemed strangely at variance with his religious persuasion. We had been visiting friends passing through Singapore and staying in the Peninsula Excelsior Hotel off Coleman Street - one of the less salubrious districts of Singapore but handy enough to the main shopping thoroughfare of Orchard Road. By all accounts the Excelsior is not to be recommended and numerous online reviews are less than flattering. Dr Des and his wife arrived after a 12 hour trip from Rome using a Singapore Airlines stop-over package. The hotel however did not have there room ready at 6:30 am when they arrived and they had to wait until 10:30 to finally get to their billet. Given that it was an SQ package and a Singapore Hotel you would thing that the airline and accommodation would have been better coordinated with the guest in mind. It must be the season for people passing through Singapore, enroute to somewhere else. Possibly this is a reflection of the change of seasons as the Antipodean hordes emulate the swallow and fly north for the winter. What ever the reason it is good to catch up with old colleagues, professional acquaintances and close friends when they are in these parts. Not that one is missing anything of the latest news as the Internet has changed all that. Long gone are the days when the steam packet from 'The Motherland' delivered month-old handwritten letters into the eager hands of expectant expatriates. Nowadays such news are just a click away, as is sport if one chooses to follow it. Here in Singapore football is soccer and there is very little coverage of rugby and none of league. Not a problem though, as I listened to the All Blacks vs. Ireland commentary online. Somehow the tight five of the All Blacks forward pack remind me of that monk. Today is the first of June. Time to recap on some recent events that either befallen yours truly or been the focus of recent Singapore interest. Old friends and regular readers of this stream of consciousness (hopefully one and the same) will recall that a couple of weeks ago I went swimming for the first time in many years . What I have failed to recount since were the events that followed. Firstly, I went decidedly deaf in my left ear, which those of you who are married will be the first to acknowledge, has some advantages. This lack of hearing failed to clear and I ended up going firstly to the university doctor and then to the NUH Ear specialist for a cure. Nothing major, but it was somewhat of a novelty having a miniature vacuum cleaner hammering against my ear drum as the E&T doctor probed and pondered. A short half an hour later (and in true biblical fashion) I leapt from the bed and walked out the door. In this case reassured that I was covered by medical insurance. Had I not been, then the modest $20 I paid to both medicos would have ballooned out to a sum of several hundred dollars. There is no doubt about it, health matters are very expensive in this country and insurance is essential. The flip side is that the doctors and specialists here are excellent. The other swimming pool related matter came a week later, when an A4 typed notice from the condominium management informed us that the pool was closed. It transpires that either a child, or a pet chihuahua on the loose, had deposited 'something unmentionable' into the water which even the chlorine had failed to eliminate (if you will excuse the pun). The removal of poop from a large pool is a costly business and according to the latest management bulletin, after two days of "extra chlorination" it is now safe to go back in the water. This I duly did today. It has become my Sunday morning routine to swim a few lengths and enjoy the water - children and pets notwithstanding. Other matters of national interest have included the list of punishments metered out to members of the prison and security services. It was their lapses that saw the terrorist Mas Selamat escape with relative ease. This case continues to occupy the minds of the populace. I have been surprised to discover how this episode has engendered such strong feelings amongst who believe that only the minor miscreants have been punished and that the politicians in charge, should have at very least offered their resignation, even if such an offer were to be subsequently rejected by the PM. The escapee in question is still at large.